The voltages induced in the rings are equal. Since ring A jumps to greater height compared to ring B, the current in ring A must be greater. This means that the resistivity of ring A is less than that of ring B. So ρA < ρB. Ring A can jump to a greater height if the mass of ring A is equal to or less than that of B. So the correct options are (B) and (D). (D) the length of the air-column at the first resonance was somewhat shorter than 1/4th of the wavelength of the sound in air. Option (A) is correct. (The second resonance will give sound of smaller intensity since the air column is longer and hence there is greater chance for the attenuation of the sound before and after the reflection at the water surface). Option (B) is incorrect since the prongs are to be kept in a vertical plane to transfer energy efficiently into the resonance column. Option (C) also is incorrect since the amplitude of vibration of the ends of the prongs is typically of the order of a millimetre only. Option (D) is correct since the anti-node is obtained slightly above the end of the resonance tube and λ/4 = l + e where λ is the wave length of sound, l is the resonating length of the tube and e is the end correction. (D) the linear speed of the charge –q is constant. The situation here is similar to that of a hydrogen atom (or, the motion of a planet around the sun) which is central field motion under an inverse square law force. The only correct option is (A) which high lights the constancy of angular momentum (Kepler’s law). [Note that the torque is zero and hence the angular momentum is constant]. A spring-mass system (unlike the simple pendulum) does not require a gravitational force for oscillations since the restoring force required for oscillations is supplied by the elastic forces in the spring. [Note that the period (T) of oscillations is given by T = 2π√(m/k) where m is the mass attached to the spring and k is the spring constant]. Therefore the change in ‘g’ does not affect the frequency and the correct option is (e). The period (T) of oscillations is given by T = 2π√[(M+m)/k] where k is the spring constant. Since an additional weight mg attached to the spring produces an additional extension e, the spring constant k = mg/e. Therefore, period of oscillations T = 2π√[(M+m)/(mg/e)] = 2π√[(M+m)e/mg], as given in option (a). 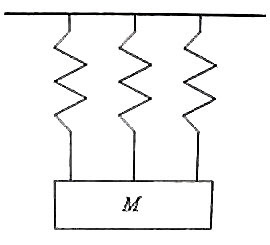 (3) The period of vertical oscillations of a mass M suspended using a light spring of spring constant k is T. The same spring is cut into three equal parts and they are used in parallel to suspend the mass M as shown in the adjoining figure. What is the new period of oscillations? 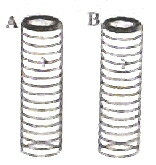 When the spring is cut into three equal parts, each piece has spring constant 3k. [Since the length of each piece is reduced by a factor three, the extension for a given applied force will be reduced by a factor three so that the spring constant (which is the ratio of force to extension) will become three times]. You will find some multiple choice questions with solution in this section here.